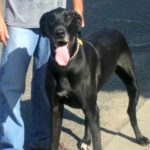 Great Danes are considered a “giant” breed of dog, yet they are as gentle as they are large. 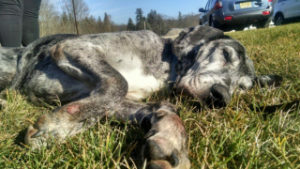 Danes are also known as “gentle giants” of the dog world. They are also called “velcro dogs” since they always want to be with their people and often have a need to be in physical contact. When you stand, they will lean on you or sit on your feet. When you sit, they will climb into your lap (yes, really)! It’s always fun to see someone sitting in a chair with a Dane perched on its person and yet its front feet are still on the floor. Danes are true couch potatoes and don’t need nearly as much space as you might think. Yes, they do take up a lot of space when they lie on the floor, your couch or your bed. Otherwise, they aren’t that active. A nice brisk walk twice a day will usually suffice. Occasionally they get an attack of the “zoomies” where they tear around like mad for a few minutes and then head back to the couch. Because of their size, obedience training is a MUST. If you have a 150-pound dog that you can’t control, you are in for problems. Danes are relatively easy to train. We recommend that you attend local obedience training classes with your dog. Be sure you choose one that does NOT use forceful methods. Danes are sensitive and want to please their people. One advantage of attending obedience classes, besides the obvious, is that your dog learns to behave in a situation with strange dogs and people in a place outside of your home. 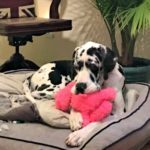 This makes it easier to take your Dane places and make him pleasant to be with. 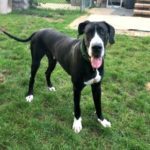 Great Danes are known as a “giant breed” since they can be over 36″ at the shoulder and over 200 pounds although the average is about 130 pounds. They also stand about 6′ tall when on their hind feet. Keep in mind that a dog of this size can reach just about anything you can. Leaving food on your kitchen countertop or on the table may be an invitation for a snack. If you’re not used to a dog of this size, some special considerations must be made. As with any breed of dog, Danes can be prone to specific health problems. Some may get arthritis or heart problems. Hip dysplasia can also be a problem with giant breeds. The average life-span of a Dane is 9-11 years. Danes need a high-quality food with a controlled amount of protein. They also need to have their food and water bowls on an elevated platform. Approximately 18″ is the norm. You may also want to think about long-term care for your dog in case he outlives you. Consider setting up a trust fund for your pet. You may also want to plan for emergency situations such as evacuation due to hurricanes or other disasters. 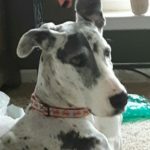 Overall, Great Danes make wonderful and loyal companions. Adopt one and see for yourself!